I’ve never really been one of those “can’t wait for the new year” people. New Years Eve has always been my least favorite holiday. I’ve never faulted a calendar number for what did or didn’t happen to me in life. But this year I caught myself anxiously awaiting 2018 to be over. Honestly, from the beginning of January, it was the start of what felt like never-ending waves knocking me down over and over again. By the time fall came around, I was ready to leave 2018 and just try and forget about it all. If I could push past and forget, it’d all go away eventually. But a few months ago in a moment of prayer, I felt God convicting me about my desire to forget. In an urgency to forget my pain and bad memories, I was neglecting to remember how faithful and good God was to me in the midst of those situations. I was neglecting to remember His redemption, peace, and kindness. I felt like He was asking me to write down some of the things I needed to remember about this year but, truthfully, I procrastinated until today to do it. Some wounds still hurt when I think about them but I know this is a part of my healing process. And more than anything, I want to be able to look back at this over the years and let the memories build my faith and encourage me in the storms to come. And hopefully, it encourages anyone that reads it in the in-between. When you were afraid of not being good enough, remember how He healed your heart and renewed your confidence. When you felt stuck, afraid of missing out on what the world had to offer, remember that He took you to new places you’d only dreamed of going to. You got to cross off bucket list items in a beautifully unexpected way. When you were crying alone in an ER waiting room, overwhelmed with panic and guilt, remember that He’s a healer and comforter. Remember the people He’s put in your life that dropped everything to come and be with you. When you did everything you could but couldn’t seem to shake that loneliness, remember how He surrounded you with friends that became family. When you were intimidated by trying new things, remember how He used it to reveal strength in you that He already saw. When you felt misunderstood, remember that He’s a friend that sticks closer than a brother. He understands more than any human being ever could. When you felt that life was unfair, remember that there’s not a single injustice that He couldn’t and wouldn’t redeem. When your heart broke for your loved ones, remember that He cared for and protected them more than you ever could. When the thought of tomorrow seemed daunting, remember that life never caught Him off guard. When anxiety felt like it was there to make permanent residence in your heart, remember how He steadied and healed you as you clung to Him. When you were frustrated with your progress and felt like you lost your rhythm, remember His kind and unending patience and grace. When the weight felt too heavy to carry, remember that He never asked you to do it alone. When you were filled with worry about letting go, remember that He was at work while you were at rest. When vulnerability felt daunting, remember that He didn’t treat your trust lightly. He’s a safe place. When you needed a change in perspective, remember how He taught you how to see the world in the light of gratitude. It made life so much more fun. When you were inclined to forget instead of forgiving, healing, or growing – remember He loved you too much to let you stay where you were. It’s worth it to remember. At the beginning of the year, the words I felt God spoke over my 2018 were “Capacity and Reliance” and there’s not a single day that’s gone by that those words didn’t cross my mind. It truly has been a test of how much I could carry as much as it’s been a test of how much I could trust. But it wasn’t a test for God to find out the answers, it was for Him to use it to reveal to me what He saw since before I took a breath on this planet. I am leaving 2018 with so many good memories, growth, and expectancy for what’s to come. I know there’s going to be challenges with every new adventure, but if anything, this year has just solidified to me that it’s always worth it. Last week I made a post on Instagram that reflected on the beginning of 2017 as being difficult for me. The more I thought on the last 18 months of my life, the clearer things became as I pieced together the timeline and seasons that led to a what was probably the most testing time of my life to date. Up until the end of 2016, most of the painful and difficult situations I’d experienced up until that point were due to outside circumstances (mostly) beyond my control. Loss, illness, an uncertainty of the future, etc. In those situations, it’s easy to cry out to God because he’s the only option you’ve got. It’s also easy to pin the blame on someone or something besides yourself when things are outside of your control. Through a series of circumstances in the fall of 2016, I came to a hard realization that I did not fully trust God with my life. His will was good as long as it was in line with mine. Obviously, most people, myself included, would not willingly admit to having this thought, but my actions spoke that even when my words didn’t. It was probably the most emotionally turbulent I’d ever been, including my emo kid stage in high school (which should tell you a lot ha). Looking back, I realized it was because I had all this pent-up frustration and nowhere to put the blame except myself. My life was good. God was good. But I had to face myself and admit that there were areas in my life that weren’t surrendered to God. I had to lay them down of my own accord, with a willing and obedient heart. Which sounds a lot more clean cut than it actually is sometimes. At the end of the year, as I was praying through my “word of the year” for 2017, God spoke these two words to me: build and nurture. I prayed through what that meant and realized that God was calling me to cherish the season I’m in and to invest in the present. To build a foundation for my life not as one who is working for the sake of busy-work, but to build with love and care. To not be afraid to lay my heart on the line, allow myself to get invested heart and soul with where I’m planted. So, as 2017 arrived and began to pass by, that was my challenge. Work hard and work well – full of love. The first few months were challenging. I wish I could say it was easy for me to take God at His word and accept that His ways were best. But it was a little-by-little process. It looked like making a cognitive choice every day to lay down my will, my agenda, and my own strength in order that I could pick up His. I thank God for His grace that always met me in those moments. The more I realized that there was peace and grace with each surrender, the more trusting I became. After a few months of taking what seemed like the same test over and over again, I one day stopped and realized that I had never been more full of gratitude in all my life. It wasn’t that I woke up one morning and my life was perfect. It was that I chose to stop and reflect and realize the goodness of God and the life He’d blessed me with. Throughout the rest of 2017, there were so many experiences that I look back at with such fondness that I wouldn’t have gotten to experience at all if I had chosen my own will over His at the end of 2016. To name a few of my favorites: I walked through the homes Shakespeare grew up in alongside my best friend. I was able to finally visit Canada and see Orca whales up close. I got to have my own bathroom in my house after 20 years (small but significant). 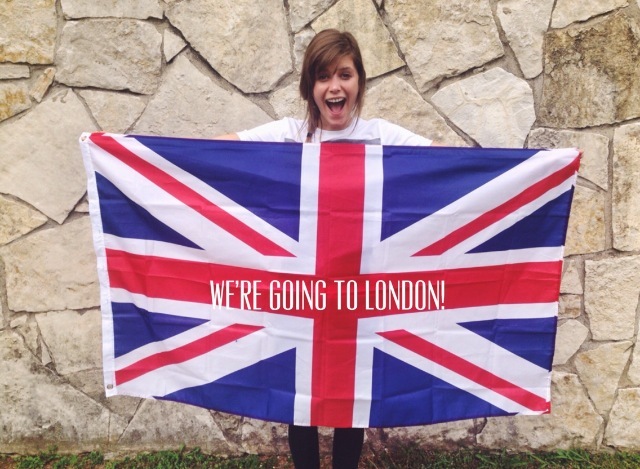 I told every riddle I knew as we traveled around London sharing the gospel. I was able to be a part of an incredible writing trip to Colorado. I broke my first bone (not necessarily exciting, but definitely memorable). I spent Thanksgiving on the beach getting a tan and feeding the cute animals that inhabited our resort. I got to serve on a criminal jury (briefly – they reached a plea agreement). And so many more memories in between. And through all of those things, my friendships with the amazing people God has blessed my life with were strengthened. With each of these adventures, I was able to learn something new about myself and God that has brought so much development to me this year. 2017 was a year of God redeeming all my “no’s” and restoring my “yes”. It was a year of God removing things from my life that I thought I needed and replacing them with things I didn’t even know I wanted. In His typical fashion, every single one of them was better than I could have imagined. And when I thought that things couldn’t get any better, He restored and fulfilled a dream in my life that I thought had died four years ago. Completely unexpected, of no merit of my own, and at the perfect timing. “Kind” is the word that comes to mind when I think of His heart for me in that moment. Right before Christmas, I was reflecting on all of this and heard God so clearly tell me “when you thought I was keeping you “from”, I was actually keeping you “for”. I had felt like God was withholding, but He really was just waiting for me to look up so He could show and give me the best things I was neglecting for good things. In the midst of all of these highlight reel moments of my year, there was still pain. There was still frustration. There will still moments when I doubted. It wasn’t the lack of hardship that made my year what it was, but an intentional choice of having a perspective of gratitude and pursuing the presence of God. I’ve made a resolution of sorts to write more. So my goal with this post was not a well-constructed, well-articulated blog but an honest reflection of a year that took me off guard in the best way possible. To anyone who might be reading this and to the future version of myself that will inevitably come back to this post – He’s big, He’s good, and He’s faithful. Every sacrifice, surrender, and struggle is worth it. He’s not keeping you from, He’s keeping you FOR. A few months ago I was driving home late at night after a long day. As I pulled closer to the light, I could tell that my window of time to make my left turn was slim but if I gunned it, I could make it. To be honest, most of the time (if I know I can make it safely) I floor it. But in a split-second subconscious decision, instead of trying to squeeze in on the tail end of the cars ahead of me, I hit the brakes. I waited. And waited. And then the light turned green. His voice snapped me out of my groggy state of mind and as only He can do, brought so much peace and revelation to my spirit. Over the last 5 years there have been promises, dreams, ideas, and more that I felt like I was “coming last” in. It seemed like it was the time to move so I’d gun it, take action, take things into my own hands. And although sometimes they’d get done, or for the sake of my analogy, I made the turn before the light turned red – there was just something unsatisfactory about accomplishing something on the tail end. There was anxiety. There was insecurity. There was doubt. But there was not that sense of accomplishment or peace that comes with following God’s will. After many seasons and opportunities of jumping the gun on the will of God, I learned to chill out. Unfortunately this happened the hard way. There was pain when I had to let go of things I was holding too tightly. There was a jolt when I hit the brakes unexpectedly on projects or opportunities. But even in my learning the hard way, God’s grace was consistent. His love was continually towards me. He was the most patient teacher and the most faithful friend. So in 2017 I learned to wait. Wait on God. Wait for my turn. Wait for the green light. I realized that there is something waiting does that hard work and responsibility can’t do on their own. And when the time came at that intersection for me to take off, I wasn’t a hurried last but an anticipatory first. I knew it was my turn. I knew I not only got to set the pace for me but for those behind me. And as God spoke those words to me, the purpose of the seasons I’d been walking through suddenly became so clear. God loves me too much to let me put myself in last place when He’s called me to be a pace setter. God loves me too much to let me make myself anxious when He knows He can offer me peace. God loves me too much to let me exhaust my own strength when His is abundant. As I waited this year, my green light came. I’ve never felt more certain that I’m right where I’m supposed to be. I don’t have all the answers, I don’t know what comes next, and sometimes day to day I don’t entirely know what I’m doing. But I know that I’m unhindered in running after what God’s called me to do. Although this was months ago now, I can’t stop thinking about it. When I’m praying through decisions or opportunities now, I wait for my green light. As you step into 2018 – If you’re feeling like you’re in last place. If you’re franticly trying to get in on the wins of those going ahead of you. If you’re honestly not sure if you’re ever even going to make it to whatever God’s called you to or whatever that dream is in your heart… wait. Wait, wait, and keep on waiting. It’s going to be worth it. And when the green light comes, floor it with all you’ve got. I’m happier than I’ve ever been before. Since I was a child, I dealt with insecurity (as most do). I did not understand how to express myself. I was incapable of loving myself. Up until rather recently, I pinned my identity on the closest things around me- my family, my school, my friends, etc. I rarely spoke up because I did not see the importance in anything I had to say. Now I can’t shut up. I talk a lot and I talk fast (working on that last bit, I just held it all in for so long so I gotta train myself to chill out). For most of that time, it wasn’t that I did not know Jesus. It wasn’t that I wasn’t living according to His word. It’s that I wasn’t looking for Him. I was looking for me. Something that does not exist outside of Him. When I jumped into that situation, there was no longer anything I could base my identity on. There was no self-searching. Just Him. At the end of every tear, every laugh, and every conversation, it was always Him. The more I found Him on accident, the more I searched for Him on purpose. Although it had not been my intention to “find myself” at that time, that’s what ended up happening. Although it was more of a realization than a finding as it was all already there. I found my passions. I found my quirks. I found my voice. I found my confidence. Now, I’m in a job I love. I am surrounded by some of the most amazing people on this planet. I love myself. And I love Jesus more than ever. The best part is- there’s always more of Him to find. With every new facet I discover, I find a new depth to my joy. I’ve found a rhythm of happiness and it revolves around Him. So, that all being said, welcome to this blog. I’m a 22 year old who’s a massive geek and massively in love with the One who made her that way. I don’t have all the answers. I still deal with insecurities and other struggles. I’ve just found out how to live joyously inspite of these things. I have had this blog for YEARS and updated sporadically. Consistency has never been one of my strengths. But I’m going to make it one. I want to share with people what I’ve learned (though it may not be much) because somehow the little things I’ve learned have led to big happiness. Hopefully they can make you happy too. I have been home from London for exactly a month today. My friend Shelbie and I spent 11 weeks there serving at Cross Street Baptist church in the borough of Islington. We truly had no idea what we were getting ourselves into when we agreed to go on this trip. It all happened very quickly. The opportunity presented itself in May out of nowhere, July we were buying our plane tickets, September we were on the other side of the world. All we knew was that we would be helping maybe start a youth group and do some work around the church. We weren’t even sure where it was we were staying. Bu,t I personally felt so much peace even though I tend to be a bit of a control freak. I knew without a shadow of a doubt that this is where God had called me to be. Within His will, there is perfect peace. To make a long story short, I’m glad we went in with a blank mental canvas because everything was much different than I could have ever expected. I had never served at another church apart from the Harvest and this church was quite different. Not bad, just obviously different cultures. We had to adapt but it was good for us and good for them to mesh all the ideas from both parties. It was such a welcoming and loving place to be. We felt so at home just being with all the people there that took us in right off the bat. Especially Pastor Nestor and his family whom we lived with for a month. We spent most of our time helping bring structure to the church services, groups, and just being a support to Pastor and helping implement the projects he had in mind. We started a community group/bible study, preached a few times, and started a pre-teen youth group that ended up growing from 3 kids to on one occasion 13 kids. We were able to invest in and love on some of the most amazing children in the UK in my opinion. One of our church connections there was being involved with an internship from another church that had a group of about 10 interns that were our age and that was one of my favorite parts of the trip. We made some really great relationships with them. Having that community was often Shelbie and I’s saving grace. Sometimes after a long week all we needed to unwind was making pizza with our friends for close to 6 hours. None of us knew it took that long to make home made pizza ha. I honestly believe that the biggest change that took place over that trip was what God did in me. I’ve never been away from home that long. I really learned to trust God in a whole new way. I learned new things about myself and faced things I had been denying. But ultimately, I felt so free to be myself. For the first time I felt that I could really show myself and not have to put on a face or try to perform or meet an expectation of me. And because of this, I never felt happier. I learned that I didn’t have to be away from home to be myself but it took being away for me to realize this. I went to a whole new and deeper place with my relationship with the Lord. On the non-spiritual end of things, we also had a blast. London is my favorite city in the world. In my favorite country in the world. I have always been fascinated with England so it was so cool that God would allow me to spend a few months there doing what I love. On our days off we really took advantage of the proximity of all the nearby beauty. Some days we spent roaming around on the bus seeing the never ending sites of the city. We went to the London Film Festival, saw a few shows in the West End, and covered as many museums as we could. Other days we would take a train and venture out to explore England. We went to a forest and bay in Gloucester, traced the steps of C.S. Lewis of and Tolkien in Oxford, climbed medieval steps in Warwick at the castle, went camping in Kent, and even got to spend a few days in France. For someone who loves learning and history as much as me, this trip was a dream come true. I want to keep this short and sweet but as I reflect back on my time I will probably post on here and transfer entries from my paper journal I kept. But know this- 11 weeks made a huge difference in my life, and I believe in the lives of the people we got to minister to. We saw big steps in people getting close to the Lord because of the way God used us. We were beyond blessed that He chose us of all people. Now, on to the next step. I’m not entirely sure what this next season of my life will bring but if I have learned anything from my past it’s that with Him every day is better than the last. I recently found out that I get the chance to staff the Mvmnt Missions trip to Scotland. I am greatly looking forward to go back to the UK and see what God is going to do! It shocks me til this very day how easily we can let our relationship with God become a boring routine. Clocking in to our prayer times or to a church service from muscle memory and nothing more. The past few years God has been trying to shake me awake from my long and groggy daze. He has peeled back the fuzzy film through which I was viewing the world. That’s the funny thing about all this is you never really know that you weren’t experiencing the most of life until you get a glimpse with clear vision. The same way people go years without glasses not realizing it’s not normal for the world to be hazy. But once you put the lenses on, there’s no going back. If I had to pick one simple metaphor and concept to describe the past season of my life, that is it. I once was blind, but now I see. When God knocked at my door, I followed him out and I haven’t ever come back to pick up the anger, the depression, and the bitterness I left behind. He has shown me so much of the world (metaphorically and literally). Over the past few years I have been to several countries and states all over the globe. But I have also stayed. I committed 2 years of my life to The MVMNT Internship straight out of high school and the combination of the travelling and planting myself and committing to the church has shaken my life. He has shown me the world but He has also shown me myself. He turned my mourning into dancing and set me free from all my shame. There was no way I could keep it to myself. I have been doing my part serving at my church, The Harvest and leading small groups, disciplining girls, serving in the office. Wherever I could lend my time and my heart, I was there. And with every passing day, even when I am exhausted or worn-out, I am reminded of the words of Isaiah “Here I am, send me.” And that He has. I was surprised last month when the opportunity came up for my best friend Shelbie and I to be sent to London this September for 10 weeks. Our Pastor knows of a church in central London that could use some help bringing life to the congregation and the city and by an amazing (and rather sudden) turn of events we were both enlisted to take this journey together. What is especially shocking to me is that I have been praying since I took a vacation there in March that God would bring me back to the city my heart was so in love with and broken for. Every time I would take a bus or walk the streets, all I could think of was different ways to come back and be a light in that city. As soon as I came home I began to research costs of living, missions programs, churches, internships, and anything like that that would help me get the foot in the door of this unrealistic dream. No one knew about it because honestly it seemed too good to be true. But God knew. And He saw my heart and heard my prayers. A few weeks later, my Pastor was speaking about shaking up your faith so you don’t grow complacent. The whole sermon I just felt a burning in my heart for the city of London. I tried to keep my tears back with the compassion that was consuming me. Towards the end of the sermon, God gave me a vision and in the vision I was standing in front of Him and He handed me a London snow globe that the snow had stopped falling on. It was all settled on the bottom. As I was looking at it He said to me “I need you to turn the city upside down.” I tipped the little snow globe and watched as the snow fell all over the city again and felt the most amazing peace and satisfaction in that moment. I knew the snow was signifying the love God wanted to pour out over the city. What I believed was a promise that would take years to fulfill took mere weeks. And now, here I am. He is sending me and I leave this September (with my best friend nonetheless) to go love on the people of London and serve and build up the church we are partnering with. It is all exciting and I know there will be challenges but I know with even more conviction that He is good. Even now, I still tear up with the endless reminders of His faithfulness to me. All that’s left between me and this journey is a couple of months and some funding. Which is where I reach out to you, already grateful that you have taken the time to read this testimony of God’s goodness in my life. Between now and the first week of September, roughly 2 months, I need to raise about $2,000 dollars. I have a huge peace about this because I know that without a shadow of a doubt, God has called me to this. But if you feel lead to help Shelbie and myself in this endeavor, we would be incredibly grateful for any financial and prayerful support. Any dollar or thought towards us as we take this on is a blessing. Any financial contributions can be made through the Harvest Church by going to bit.ly/HelpUsGoToLondon or to my PayPal account: Bianca.Barja@gmail.com. And if you are not able to contribute financially at this time, all we can ask is for your prayers. We will be interceding for the city of London, the pastors and congregation of Cross Street Baptist Church in London, and for God to do His will in and through us on this trip. We will be starting a blog/newsletter here soon as well to keep everyone updated on this amazing opportunity, so keep your eyes peeled! Thank you again so much for your support! We are incredibly grateful! To be honest, the past few weeks I’ve been going through a bit of an existential crisis. I had planned on staying at my job (that I loved), going and pursuing administration at the church, and doing my thing for this next year. After a series of events, God asked me to not pursue administration. The baby I nanny was put in preschool so they didn’t really need my help anymore. I was several hundred dollars short of finishing paying for my Scotland missions trip and had no job and no idea what to do with my life. I applied to teach at a private school but just felt that that also was not right and turned down pursuing that further. I honestly began to get a little frustrated an impatient with God because nothing was going “right”. Let’s take it back to a few months ago. I was in London, England for a few weeks with my sister. The whole time I was there I kept thinking how I would love to take a missions trip team there or go serve at a ministry there because of endless amazing opportunities. I came back to the states with a desire to return to London and talk to my Pastor about leading a trip there next summer. Missions are my passion. I serve locally but there is something about global missions that I adore. And I know that God has called me to that and that’s another reason I was frustrated. I had been promised by God to be sent out globally but felt stuck here in my dinky little town. I was talking to our missions director last month about taking a trip to London next summer and had been doing research to see how we could make this possible before telling my Pastor about any of it. Almost 3 weeks ago, my Pastor was speaking at our youth church on “Stir it Up” and shaking cities and shaking up your faith so you don’t grow complacent. The whole sermon I just felt a huge weight on my heart for the city of London. The countless people that are just living their mundane lives day after day riding around on the tube with their heads down. They need stirring. Towards the end of the sermon, God gave me a vision and in the vision I was standing in front of Him and He handed me a London snow globe that the snow had stopped falling on. It was all settled on the bottom. As I was looking at it He said to me “I need you to turn the city upside down.” I tipped the little snow globe and watched as the snow fell all over the city again and felt the most amazing peace and satisfaction in that moment. I knew the snow was signifying the love God wanted to pour out over the city. Later on that month I was researching churches in the London area and YWAM bases there. I even emailed YWAM and inquired about if they hosted teams or individual missionaries. I knew it was a long shot that I could go there this fall, but I was kind of desperate at this point. The next day I was talking to my best friend Shelbie and we were both kind of the same spot about praying where God wanted us this fall as doors kept closing. She was talking to me about how our Pastor had mentioned to her that he had a pastor friend in London who needed help at his church for a few months this summer (July/August ish). I told her to totally do it and I would go visit her and really wanted to tag along if I could. But it just didn’t seem like it was feasible and honestly I felt like something like that would be too good to be true. But, maybe if the timing worked out. I was going to Scotland late summer so I didn’t think the timing would work anyways. I had actually wanted originally to stay in Scotland after the trip and travel back down to England but again the timing did not work. That night I went to bed a little hopeful. I told myself even if I couldn’t go with Shelbie, I would try to go back this fall. But it would have to be in September because the One Direction concert is August 24th and I really didn’t want to give up my tickets (priorities am I right ha). I fell asleep with dreams of walking along the Thames again sharing the gospel. I woke up with those dreams made real. Literally. I woke up and my phone was buzzing with texts. Dustin (my pastor) had texted Shelbie again and long story short asked her if she had thought about London anymore because he felt that it would be a good opportunity for her. But, he said, he wanted to switch it to September and send two people! WHAT ARE THE ODDS! So she told him everything and I texted him as well and we all began to get extremely excited about what this could be. I didn’t want to get too ahead of myself so I immediately opened my Bible and asked God to speak clearly to me that this was something I needed to do. The first thing I opened up to was Haggai 2:4 “Be strong… and work fro I am with you”. I don’t want to waste words going into all the meaning the words “Be Strong” have on my life but it is my life verse (Joshua 1:9). It means the world to me. God has had this work spoken into my life in the most critical tipping points of my life. I have it tattooed on my wrists in Hebrew. This specific verse with “be strong” was the exact verse God gave me when I was praying about going to Thailand last year and doubting my call to missions. The verse goes on to talk about how He will show His glory in all the nations and how the present glory will be greater than latter glories. it was perfect timing. God timing. That was the final confirmation for me. I told them I was in. So early September we will be spending two and a half months together in London serving at a local church and sharing the gospel right in the middle of London. The fact that I not only get to to go but God is sending me with my best friend blows my mind. He is SO faithful to me even when I get so easily frustrated or impatient and bratty. I found a job that is AMAZING and I didn’t think these people would hire me since I plan on being gone for 2.5 months in the fall and called and told them about it and literally said to Shelbie “it will ONLY be God if they hire me” (they specifically said they were looking for someone who could commit to sticking around) but when I called they said they were super intent on hiring me and would be willing to work around my absence. WHAT! I don’t mean at all that God’s favor IS material things or opportunities, but He has certainly used them. And to me it wasn’t about the stuff or the things, it was that He saw all the little desires of my heart and was closing doors I thought were “good” to give me what was BEST because He loves me so much. I’m so dumb sometimes but God is so faithful to me anyways. Wow.